Angel Rodriguez with a gorgeous crossover on senior center Demarco Cox to get into the lane. No one left in front of him and he hits nothing but …. glass on a wild layup attempt to start the second half. That’s the kind of night it was for Rodriguez, who finished with zero points on 0-for-8 shooting and four turnovers in the Hurricanes’ disappointing 70-50 loss to Georgia Tech at the Bank United Center Wednesday night. The Hurricanes, back in the rankings at No. 23, also lost at home to Georgia Tech in March of 2013, that time by two points. The Yellow Jackets (10-10, 1-7) never trailed in their first ACC win of the season and first victory in 2015. Rodriguez is now 5-for-37 (12.8 percent) shooting the ball in the last four games. Reminiscent of the first half against the University of Virginia, Miami (14-6, 4-3) started out sluggish and missing shots. The Canes trailed by 14 at one point and ended the half down eight on 10-of-30 (33.3 percent) shooting and 4-of-17 (23.5 percent) from behind the arc. Georgia Tech, which came in 288th in the country in field goal percentage at 40.8 percent, went 25-of-44 (56.8 percent) on the night. Georgia Tech jumped out to a 20-6 lead, forcing Hurricanes coach Jim Larrañaga to call a timeout with 11:45 left in the half. The Canes made a mini surge toward the end of the half with three three-pointers by sophomore guard Davon Reed and freshman guard Deandre Burnett to cut Georgia Tech’s double-digit lead down to six with 1:38 left, the closest Miami would get all game. A three-pointer by sophomore guard Manu Lecomte with eight minutes left cut Georgia Tech’s lead to eight and seemed to give Miami life. The Yellow Jackets responded well, though, and quickly pushed the lead back up to double digits. The Canes never threatened again. Junior center Tonye Jekiri had another nice game for the Canes, finishing with a team-high 13 points on 5-of-6 shooting and nine rebounds, but he could not carry the team by himself over a hot-shooting Georgia Tech squad. 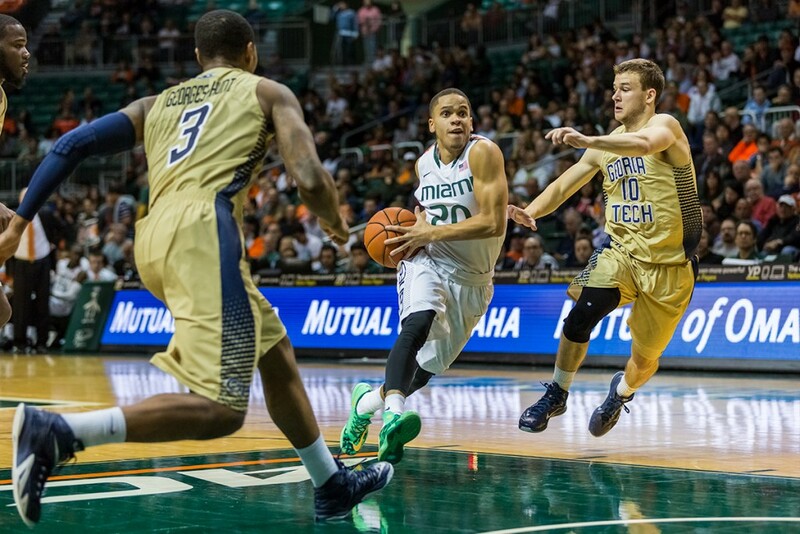 The Canes shot a ghastly 35 percent (19-55) on the night and made a mere six threes on 26 attempts (23 percent). The Canes next play at Florida State (11-10, 3-5) at 12:30 p.m. on Sunday.